Author: Kelly Nicholls is the manager of advocacy and public affairs with Médecins Sans Frontières Australia. As world leaders gather in Washington DC this week for the International AIDS Conference they will face the stark reality that we are only reaching half the people who are in urgent need of life-saving treatment. On a recent trip to Burma with Médecins Sans Frontières I saw this firsthand. HIV/AIDS patients come to our overflowing clinics in Yangon to receive the lifesaving antiretroviral drugs, only to be told they are not sick enough for treatment. My colleagues, our doctors, are placed in an impossible position, forced to ration treatment because there simply is not enough funding. The alternative would be to treat people at an early stage of their disease, thus preventing associated illnesses, reducing transmission and dramatically increasing their chance of survival. However, by making this choice doctors would have to turn away the sickest patients, essentially leaving them to die. When you come from a country like Australia it's a hard decision to grasp. Imagine visiting your doctor with a life-threatening disease and being told, ''Sorry, you're not sick enough, come back when you're on death's door and then I'll treat you.'' But that is exactly what is happening in Burma and many other countries. In Burma, an estimated 120,000 people living with HIV are in need of lifesaving treatment, but fewer than 30,000 of them received treatment last year. Burma has some of the lowest coverage rates for antiretroviral treatment in the world. Expected funds from the Global Fund to Fight HIV/AIDS, Tuberculosis and Malaria's Round 11 would have paid for 46,500 additional patients to be placed on antiretroviral drugs, helping to significantly scale up treatment throughout the country. However, anticipated funding from Round 11 was cancelled last year. Thus, the large gap between need and treatment remains, leaving tens of thousands of lives hanging in the balance. International donors like Australia who are increasing aid funding to Burma are obviously faced with a myriad of needs to choose from and, yes, treatment is expensive. 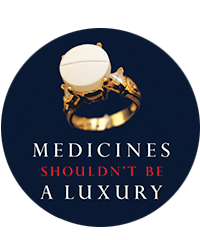 But an area where there is such a stark gap between need and access to life-saving treatment should be prioritised. The AIDS conference is being held at a time when scientific evidence has shown that prompt and early HIV treatment not only saves lives but also prevents new infections to a partner by 96 per cent. This proves that if we place more people living with HIV on treatment earlier, we can stop them developing AIDS as well as significantly reduce transmission and thereby curb the epidemic. By ambitiously expanding treatment, according to research by UNAIDS, 12 million infections and more than seven million deaths could be averted by 2020. However, despite the imperative to scale up treatment now more than ever, many donors are actually reducing support for the Global Fund, the leading international funding mechanism for AIDS. In September UN Secretary General Ban Ki-Moon will host a dinner during the UN General Assembly session in support of health-related development goals, with a special focus on the Global Fund. This will give Australia and other state donors the opportunity to pledge increased funds for the Global Fund, which supports over half of all those on antiretroviral treatment. Increased funding is needed to reach all those who currently cannot obtain treatment. A prerequisite to treatment scale-up is the affordability of antiretroviral drugs. There has been an enormous advancement in this area over the past decade with the first generation of HIV/AIDS drugs dropping in price nearly 99 per cent from $US10,000 per person a year in 2000 to roughly $US150 ($A145) today. However, increased patenting of newer treatments poses a grave threat to the affordability of the drugs that will increasingly be needed, and many of the newer drugs are priced out of reach. India, the world's main producer of generic HIV/AIDS drugs, used in more than 80 per cent of donor-funded antiretroviral programs, faces multiple threats - from free trade agreements (notably the EU-India FTA) and the ongoing attack on India's pro-health patent law by Swiss pharmaceutical company Novartis. Similarly, in our region, affordable access to life-saving medicines like antiretroviral drugs will be put under threat if restrictive intellectual property policies pushed by the United States are included in the Trans Pacific Partnership trade agreement. The developing countries included in the agreement - Brunei, Chile, Malaysia, Peru, and Vietnam - are being put under intense pressure to comply with these policies. The US demands include requirements to lower the bar for granting patents, limit the capacity to challenge patents, and impose new forms of monopolies and of intellectual property enforcement - all measures that delay the introduction of more affordable medicines. Australia has taken the positive stance of protecting domestic health policy. However, the government should take a step further in defence of the right of people living in developing countries to have affordable access to medicine. This is important not only for this specific trade agreement, but also for the precedent that it may set. In 2014 Australia will host the World AIDS Conference and thus will be in the spotlight for our efforts to treat and prevent this epidemic that kills about 1.8 million people every year. Hopefully, our government will be able to showcase all the work it has continued to do to prevent thousands of deaths.